I loved back-to-school time when I was a kid – the new clothes, the crisp notebooks, the smell of freshly ground pencil dust. It was a chance to walk into school on the first day and have everyone say, “Whoa, Jim became totally cool this summer!” While this never happened, the idea made my stomach flutter with pre-pubescent possibilities. Nowadays, seasonal beers are what get my belly bubbling this time of year. While this might seem like a let down compared to discovering that your summer crush is in your homeroom, it’s still the most exciting season for beer geeks, because the fall craft beer releases are the best of the year. Oktoberfest beers got their start when a handful of German breweries were commissioned to brew beers for the wedding of Ludwig I in 1810. The wedding reception must have been quite the hit, because the party has continued for over 200 years under the banner of Oktoberfest. Hacker-Pschorr Original Oktoberfest Amber Märzen is aptly named, as the brewery was one of the handful that brewed for Ludwig’s big day. This 5.8 percent ABV lager pours a deep amber and treats your taste buds to crisp flavors of toffee and bready malts with just a hint of fruitiness on the back end. Closer to home, Left Hand Brewing Company's Oktoberfest Marzen Lager is a 6.6 percent ABV triumph of caramel, biscuit and touches of pear, with a slightly herbal afterglow. Great Lakes Oktoberfest also has all the hallmarks of a well-made Märzen — the rich amber color, a bready malt backbone, the Noble hop finish — but still manages to put its unique spin on the style, with a hint of raisin lurking in the malts and a flourish of citrus on the finish. It seems that just about every brewery has gone gonzo for gourds this time of year, but that doesn’t mean everyone is doing it well. 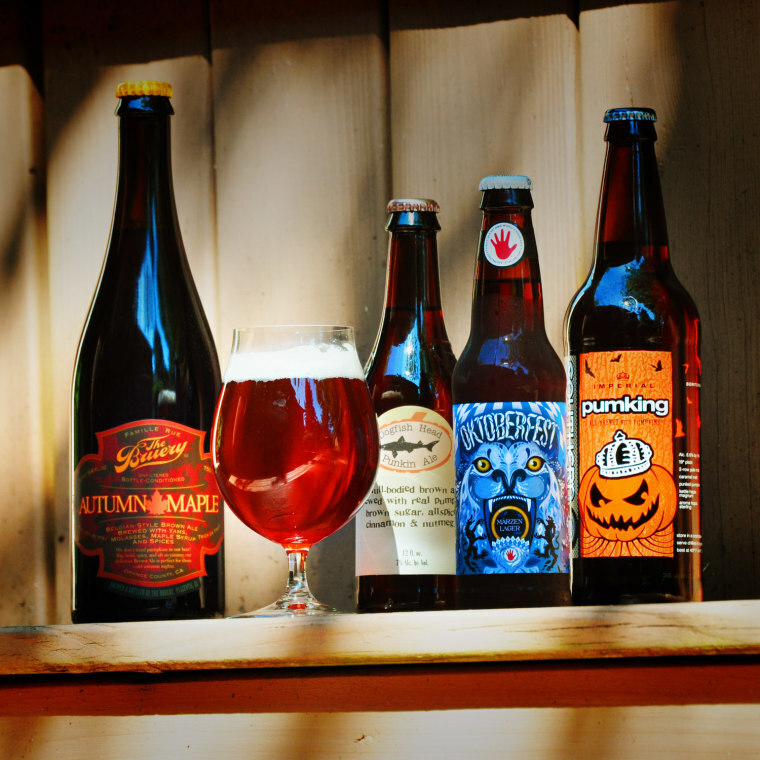 Dogfish Head Punkin Ale was the beer that put this off-center brewery on the map, when it won first place in the recipe contest at Delaware’s Punkin Chunckin festival in the fall of 1994, a full six months before the brewery officially opened its doors. Punkin Ale will snuggle your palate with the rich seasonal tastes of pumpkin pie, featuring touches of allspice, nutmeg and cloves, while its 7 percent ABV will warm your chest when the temperatures start to dip. There’s only one beer I truly crave when the leaves begin their fiery color show: Southern Tier Pumking. This 8.6 percent ABV ale smothers your senses with roasty tastes of pumpkin and thick threads of vanilla and pumpkin pie spices. If you like a pumpkin-pie-in-a-glass this time of year, look no further than the ‘King. For a seasonal treat with a twist, check out The Bruery Autumn Maple, a 10 percent ABV ale brewed with yams, molasses, vanilla, seasonal pie spices and maple syrup. The result is a sophisticated sipper that starts with a sweet and peppery earthiness thanks to the molasses and spices, and ends with the caramelized richness of sweet potatoes. Everyone knows that fall is harvest time, and that goes for hops as well — over 90 percent of the world’s supply is harvested between the beginning of September and the end of October. While most of these hops are destined to be dried and frozen, a growing number of brewers are taking them fresh from the fields and crafting harvest ales, which capture the essence of these flavorful little flowers while they’re still brimming with tasty resin. Sierra Nevada saw their local barley crop fail last year, scuttling production of their well know Estate Homegrown Wet Hop Ale. Undaunted, they created Sierra Nevada DevESTATEtion Black IPA, a 6.7 percent ABV ale which uses fresh local hops, along with organic malts from the Northwest. Expect a mildly roasted malt profile to serve as the earthy backdrop upon which the lush and citrusy hops will work their aromatic magic. Also look out for Flying Dog Secret Stash Harvest Ale. This year’s edition will be a 5.5 percent ABV Belgian ale brewed with locally grown raw wheat and Cascade and Chinook hops. Sixpoint Autumnation changes every year as well, and for 2013, the brewery invited its fans to choose which fresh hop to feature. The winner was Mosaic, a versatile hop variety that can provide a host of different flavors depending on how the brewer uses it. Sixpoint promises a well-balanced 6.7 percent ABV ale featuring tastes of citrus, pine, stone fruit and berries. Whether you explore Oktoberfests, pumpkin beers or ever-changing harvest ales, it’s nice to know that fall can still be a season bursting with possibilities, long after your school days are over. And who knows — maybe you’ll run into that old flame from homeroom singing along to “Ein Prosit” in a beer tent somewhere.